The SNAP-ENET-D64 Ethernet I/O brain is an I/O and communications processor that connects digital devices with Ethernet networks for monitoring, control, and data acquisition. The SNAP-ENET-D64 mounts on a SNAP-D64RS rack with up to 16 SNAP standard digital I/O modules, for a maximum of 64 points of I/O. Note that 32-channel SNAP digital modules cannot be used with this brain. High-performance, flexible SNAP Ethernet brains are part of Opto 22s SNAP Ethernet systems, which let you connect to stateof- the-art Opto 22 industrial I/O hardware using a standard TCP/IP Ethernet connection. 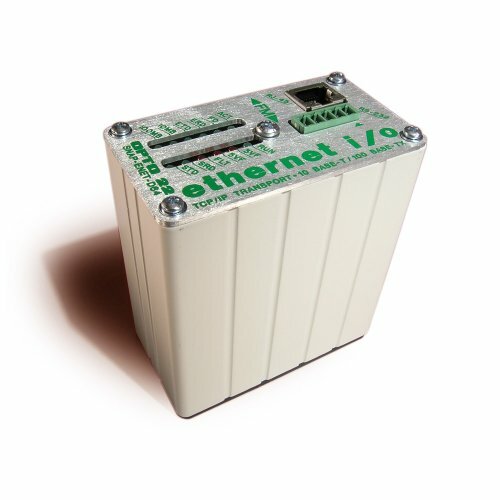 Combined with analog, digital, and special-purpose I/O modules on a standard SNAP mounting rack, the SNAP Ethernet brain forms an I/O unit that can be used alone or as part of a distributed control system based on an Opto 22 industrial controller, such as the SNAP PAC standalone or rack-mounted programmable automation controllers. A SNAP Ethernet system can be attached to existing Ethernet networks, making it easy to add monitoring and control where necessary. Or you can use standard Ethernet hardware to build an independent control network. You can also communicate with the system via a modem connection using Point-to-Point Protocol (PPP). A modem connection is ideal for remote locations or other places where an Ethernet network is not practical. brain is a digital-only processor. (Not recommended for new development. If you have any questions about this product by Opto 22, contact us by completing and submitting the form below. If you are looking for a specif part number, please include it with your message.